Display®: Welcome to the Club! The Grenoble-Alpes-Métropole, commonly known as "La Métro", is the urban agglomeration making up the Grenoble community. Flanked by high mountains and fringed with verdant countryside, this is a dynamic, prosperous and high-tech area. With its wide range of leisure activities and major research centres, it consists of 26 communities working together, combining their efforts in order to improve the daily life of their 400,000 inhabitants. This Grenoble urban agglomeration is laid in the heart of the region "Rhône-Alpes", France’s second largest region after "Île de France". Breakdown of buildings: schools (37 %), socio-cultural (26 %), sports (18 %), administrative (7 %), and day care centres (7 %). Aim In 2006, the metropolitan area of Grenoble-Alpes-Métropole created a Display® Club under the direction of the local Energy Agency. Its goal is to make it easier for communities to become part of the Display® Campaign by helping them launch dynamic communication campaigns. Key points The greater metropolitan area of Grenoble-Alpes-Métropole was one of the first French conglomerations to adopt a Local Climate Plan. Almost all of the 26 communities in addition to a number of municipal actors (sponsors, energy providers, universities, banks, associations, etc.) have taken part in the implementation of this plan at the local level with a number of goals set for 2010 (reference year 1999): stabilizing energy consumption and CO2 emissions and increasing the share of renewable energy and power consumption to 21 percent. The Local Energy Agency of Metropolitan Grenoble (ALE) has taken a leadership role in managing this Local Climate Plan (LCP). In the longer term, the metropolitan area of Grenoble has more ambitious plans: in its "carbon challenge", it plans to reduce its greenhouse gas emissions by a factor of four by 2050. In its Local Climate Plan, Metropolitan Grenoble has decided to motivate its communities to take part in the Display® Campaign. It has entrusted the ALE with this task, and the ALE has created a Display® Club for participants to help communities use the tool and share their experience and strategies. 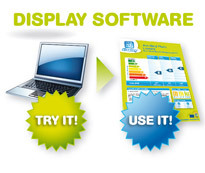 _ - The ALE has produced a two-page overview of methods concerning implementation procedures and the printing of Display® posters. - For the printing, the ALE selected a printer taking into consideration the quality and price. The ALE has implemented a simple procedure for the production of the posters, including a selection of several formats and a lamination option. - A "Display® information bulletin" is sent out to the members of the Club at least once a year when the Club meets at the end of the year. It summarises the figures from the posters, provides an overview of the progress the campaign has made within the metropolitan area, discusses some of the highlights of the year, and presents goals for the following year. The two first Display® bulletins are available on the ALE’s website. - A "common list of simple measures and technical solutions" was also drawn up to make it easier for communities to fill out these two categories on the Display® posters. This list grows longer as the communities fill in their own posters. - Display® stickers covering the four main areas of energy and water consumption (heating, lighting, information technology, and tap water) are also handed out for free to communities that are involved so that they can raise awareness among the building users. - Various actors share their experience with their posters and awareness-raising / communication campaigns during these meetings. _ The ALE’s new website, which went online in October of 2006, has a special Display® page with the latest news on the metropolitan area’s campaign. All of the documents are also available there. Pupils presenting proudly the poster of their school. Only 13 posters were displayed by the end of 2006 but this number has progressively increased to 118 at the beginning of 2007. This figure is expected to grow over the course of 2007 as the Display® Club performs its work. In addition, a good example is being set by pioneer towns such as Pont de Claix, Meylan, and Seyssins and towns such as Domène, Echirolles, Fontaine or Saint Egrève, which have just begun hanging up Display® posters in their buildings. The awareness-raising campaigns for energy management focussing on technicians, administrators, schoolchildren, and the general public have been launched in a number of communities. For example, the community of Fontaine is working on a definition of "simple changes" for the Display® poster in collaboration with building users. In addition, the town of Echirolles has launched a major education programme in schools concerning energy; it also addresses users of the town’s sport halls. The communities are implementing innovative awareness-raising information campaigns, two examples being Domène (where the "Municipal Children’s’ Council" has adopted Display®) and Saint-Égrève (where the Display® Campaign was officially launched when posters were made public at a ceremony in the City Hall). - filling in the categories "simple changes and technical solutions" remains a difficult task even though a list has been made available. _ Both communication concerning the Display® Campaign and the number of buildings taking part and displaying the posters should increase quickly all over the municipal area of Grenoble.